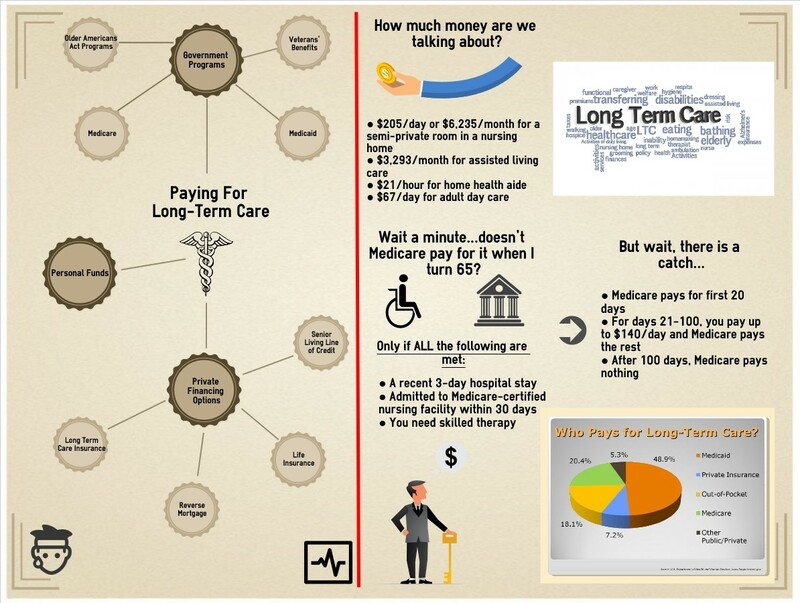 The topic of paying for long-term care is an overlooked issue in health care. None of us want to think about living our final days in the nursing home, but statistically speaking, many of us will. How will you pay for it? What are the options? Long-term care in this country can be divided into two general classes based on funding: governmental and private payers. In terms of government programs, Medicaid will pay for a nursing home or rehab, whereas Medicare only pays for a maximum of 100 days of post-hospital recovery care. On the other hand, private insurance companies offer what is referred to as long-term care insurance to cover prolonged long-term services and supports. Let’s take a closer look at how these types of funding often work together. When I discharge an older patient from the hospital to a nursing home, what typically happens is Medicare pays for the first 100 days (only 20 days are covered in full). Then, patients are forced to “spend down” their assets to qualify for Medicaid coverage. As a quick review, Medicaid is a joint federal and state program that only pays for long-term care if an individual has utilized all personal financial assets that exceed the income cutoff level for coverage. And the Medicaid income cutoff level varies by state. In other words, patients must first pay out-of-pocket until they hit the poverty line, then they can qualify for Medicaid. This often leaves individuals with minimal remaining financial assets, which is particularly devastating when one spouse becomes ill, utilizes all the assets and leaves the remaining spouse in financial ruin. Statistically speaking, it’s often the man who becomes ill and negatively affects the wife. This “spend-down” is something I’ve witnessed countless times as a physician. It can be quite depressing in that people work their entire lives to build a nest egg for retirement, then become ill and require long-term care, but don’t have insurance to cover it. This obviously doesn’t sound like an ideal approach to paying for long-term care. So what can be done? First, long-term care insurance might be an effective option for you. These policies reimburse policyholders a daily amount (up to a predetermined limit) for services to assist them with activities of daily living. The nice thing is these policies will cover care you receive no matter the location — at your own home, assisted living or a nursing home. It is much easier to arrange long-term care services for those with long-term care insurance, and the quality of available facilities often exceeds that of Medicaid facilities. Long-term care insurance allows policyholders a larger number of options because these plans reimburse facilities quite generously. Meanwhile, finding a nursing home for Medicaid patients can sometimes be a challenge in that there is high demand for this type of low-income, long-term care facility. So what’s the downside of long-term care insurance? As you might’ve guessed, the main one is cost. These policies typically carry an expensive premium, but they do enable patients to have high-quality, long-term medical care and will help protect your financial assets in later years. Most financial planners recommend purchasing long-term care insurance around 55-60 years of age, but of course, this can vary depending on your situation. A second private pay option is a Health Savings Account (HSA). A HSA is a savings account used in conjunction with a high-deductible health insurance policy. By putting pre-tax dollars into a HSA starting now, funds can grow over time and be used later, not only for long-term care, but any qualified medical expenses. Per IRS rules, the 2018 HSA contribution limits are $3,450 for individuals and $6,900 for families. I suspect these accounts are still very underutilized. Kevin Tolliver is an internal medicine physician who blogs at My Medical Musings. Is Medicare for all the future? Only the public can decide that. Who is caring for the care workers? Health care stole the American dream. But it’s absolutely possible to take it back.